It works fine, it's kinda weird but something behind the dash clicks before the dash lights come on, sometimes it tales a while. They are not as bright as when I had them wired for 12 volts, but I can see everything just fine, and they dim to basically off by turning the knob. I did notice bleeding to other areas, if I drive a lot at night I might try to do something about it but I really don't drive at night much anymore. I now know what this truck weighs, it is 3940lbs put away wet, that is around 500lbs more than it weighed before the chassis change, but it has a dump bed now and instead of using wood for the flatbed I used steel, don't know which weighs more on that front, it's likely a wash, but the hydraulic assembly and associated steel beams are likely where most the extra weight came from. Fatty! My old pickup was 2800#. I have had a vibration lately when I start out that goes away when I get going, it only happened when I just let out the clutch, but another vibration started while at higher rpms, so today I lifted the bed and front of the truck and inspected the driveline, the front U-joint of the rear drive line just over the carrier cross member was bad and the carrier rubber piece was really bad. I tried to remove a good rubber piece from another drive line I have and I could not get it to budge, so I did the rubber hose/zip tie fix on that, I also had another rear drive line piece that was good so I installed that on the front piece of drive line I repaired with the hose/zip tie fix. I took it a couple blocks and all was good, we shall see if it holds up at freeway speeds without vibration, I suspect the starting out vibration was the center of the drive line moving around in the rubber piece enclosure, the freeway vibration was likely the bad U-joint. I need a tool to remove them rubber pieces from the drive lines, I tried knocking it off with a chisel and hammer but it didn't move, I didn't want to ruin it trying to get it off so I didn't really hit it that hard. I had a squeak after the fix that went away for the most part, I suspect it is the other u-joint, when I greased it only 2 of the joints had grease coming out of them, I expect I will have to do that u-joint within the year, but I already changed the u-joint in the drive line I removed, so I will just change it out when I notice that one getting loose, too bad that front connection is under the cab, that makes it a pain to change it out unless I remove the whole 2 poece drive line which is also a pain. 2 piece drivelines can be troublesome, for sure. Ever had it balanced? New joints, carrier, and balancing might make it feel like a whole different truck. I suppose I should have marked the other original drive line before I took it apart so I could put it back the same way, but that one can only go in 4 different ways of which one of them ways was balanced before I put in the new ball joint. Right now I do not recall having a vibration, I had a squeak starting out under load, it went away when I got moving after around 25mph, fact is it squeaked and then one time it made a much louder squeal for a second like when the lower counter shaft bearing lets loose in the transmission, it has not squeaked much since, I do not believe it was the transmission squeaking because the squeaking happened the first time I got up to speed after fixing the drive line, all I know for sure is that it doesn't have that clunking or clang it had before when the u-joint was bad. When I pulled all my drive lines out of the shed I pulled the original modified drive line from the 521 also, it looked really close, since the rear part has a slip joint I may look at that one again if I have any more issues. Well the engine/transmission started making this knocking sound when I shifted gears, and it would seem to be out of balance, if I pushed in the clutch and let it out it would sometimes get back in balance, so this made me think it was the flywheel coming loose. Well it turned out to be the transmission being loose, this has happened several times to me over the years, and it has had different symptoms every time, this time every bolt was loose except for the lower starter bolt, the top starter bolt was not in it's hole but it fell on the ground when I removed the starter, so it was between the block and starter, every other bolt was loose. I don't understand why this happens to me all the time, but I suspect it is happening because of how I use the truck, it is a work truck, but it is doing big truck duties and it is not a big truck, most would think I put the truck thru hell every day, it does get a work out with all that weight and the heavy trailer I pull behind it, but I have been doing it for years and I do not see any reason to stop now, fact is it stops better now than it ever has in all the time I have owned it. I am happy I got under it though, the clutch pushrod was too tight, I removed it and made it shorter, that could not have been good having pressure on the throw out bearing all the time, but it is loose now. I sure am happy it was not a loose flywheel, that would have been a job to tighten them up. 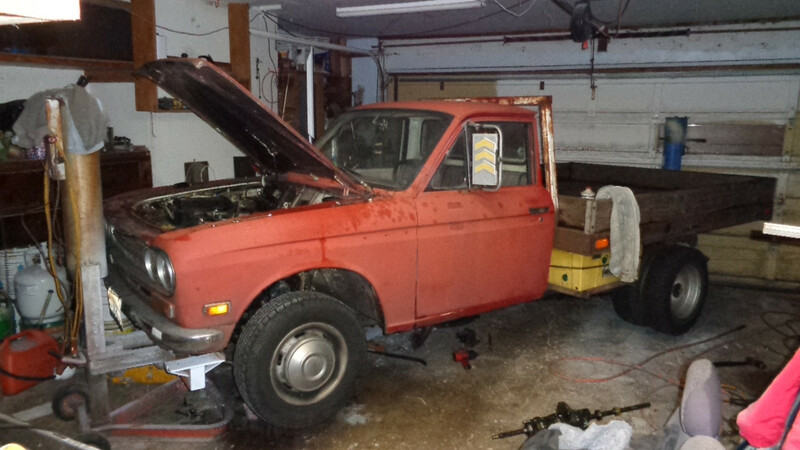 I really like this starter I have, it is rather large, but it turns the engine over faster than any other starter I have had in this truck, and it works every time, I believe it is a starter out of the 86 720 with a Z24, it is the best starter I have ever had in any truck with an L block. Seems like an odd thing to keep happening. Loctite? I had 2 of my transmission to engine bolts fall out once. The two left were tight... I would just loctite and be done. Except for the top starter bolt that was missing between the block and the starter none of the bolts holding the transmission on were looser than a couple turns, but it sure made a lot of noise by the time I got home today, it actually made a noise a couple times a few days ago getting on the freeway while shifting but it went away after noting it in my mind, but today was different, things felt out of balance, and it got worse fast! I tighten these bolts down with air tools, they are tight, but the top 2 transmission bolts are too close to the firewall so I have to tighten them down with a wrench, I actually don't have the two 12mm bolts on the bottom holding the plate to the transmission case, but I do not feel this could cause the other 4 bolts and the two starter bolts to get loose(only 1 starter bolt was loose/missing), I feel if that lower starter bolt had come loose also I would have had issues before today, weird thing is that lower starter bolt stripped out in the transmission case, so I drilled it all the way thru the case and I put a much longer bolt all the way thru and I put a big nut on the case side, this was the only one that stayed tight. I fixed it/tightened the bolts today and will check them every once in a while, it lasted 8 months this time, so just before work picks up in March 2019 I will check them, that will be 7 months, I might check them before if I think about it. Today I tightened them with air tools again, but followed them with my ratchet wrench, they are tight. So today I drove this truck without the trailer, I emptied the flatbed, replaced 3 X-mas light bulbs that had burnt out since I put them up, just before I got to that place I had noticed my turn signals were not as bright and slower, I looked at the volt gauge and it was under 12 volts barely so the radio had not started cutting out yet, the alternator was not charging. So when I parked it at that X-mas light thing I lifted the hood and looked for an issue, it was exactly the same looking as I had it back in February when I put this truck back into service after the chassis/wiring harness change, the thing is that it has always charged fine without the "T" plug inserted into the alternator, now I know this is weird, but as I recall it was always charging but the ignition light did not work when the "T" plug was connected and it charged fine even when the "T" plug was not plugged in so I left it unconnected, well it was not charging now so I plugged it in and started it, no change so I headed for my next stop, after about a mile I had to make a left hand turn and used the turn signal and it was bright as ever now and blinking fast like normal, I looked at the volt meter and it was at almost 14 volts, when I parked it at my next stop and turned it off I noticed the ignition light came on, I turned the key on and the light worked now, something in the alternator changed and now it works properly, it only took 9/10 months to fix itself. I am hoping this is not my Datsun talking to me letting me know to start looking for an alternator. OK, I should say that a different way, yes my Datsun is always talking to me, but not talking negatively like it did today for a while. It appears my work truck is mad at me. 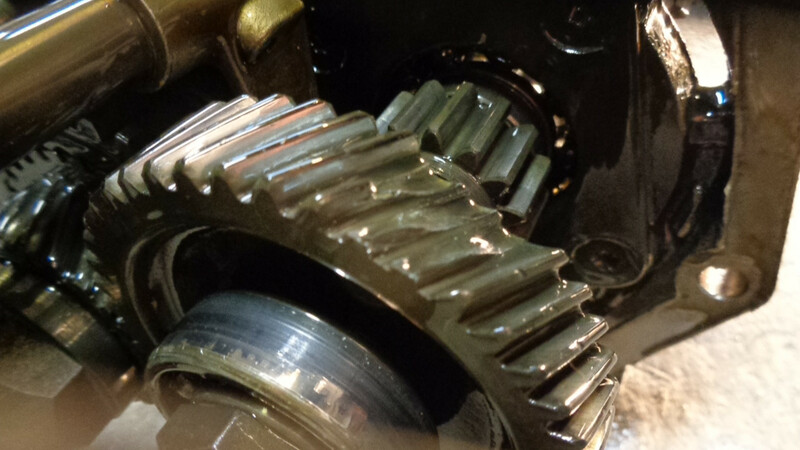 That is 5th gear on the cluster gear shaft, how does one take teeth off 5th gear? I took it out thinking front bearing as it made noise at an idle, but I noticed it while on the freeway and when I started slowing down it made a loud clicking sound in 5th gear, I drove home in 4th gear, all the bearings are good, so was the gear oil, so I took the tail housing off and seen this above. I was kinda bummed out that I had to remove the intake and exhaust header to get the transmission out, I am thinking about tearing apart that smog manifold I have and plugging the holes and putting that on the engine. I emptied the garage and pulled it in there to do this, I wanted a dry place to work. 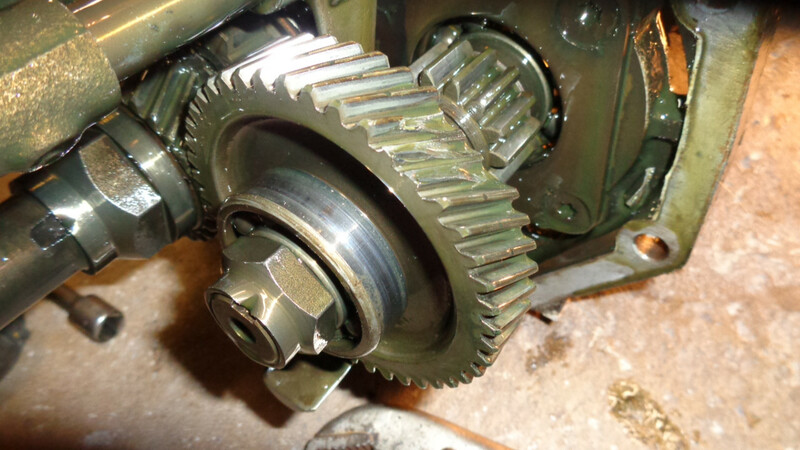 I think it knew I was talking about it yesterday and it got mad at me, I am not sure what I am going to do yet, the gear it meshes with looks alright as i did not drive it but a couple miles after the clicking started, I only found one of the teeth in the rear case, I do not have any 5 speed longshafts apart, I do have two extras but I know very little if anything about them, one is ready to install but I like this one except for the clicking in 5th gear. It sure does, I am going to look at the 5spd short shaft I have apart, maybe I can use that ones 5th gear. I really do not know if that is really 5th gear or if the one it meshes with is 5th gear, but that gear is screwed up. If I had known what the issue was I would have rebuilt or at least gone thru another transmission before taking this one out, I could have not used 5th gear for a while, I just don't understand how I took teeth off of 5th gear, 1st I can understand, but not 5th. Last edited by wayno on Sat Dec 01, 2018 9:36 pm, edited 1 time in total. Maybe it wasn't a torque rated failure and there was just a piece of debris that got in there and broke teeth. 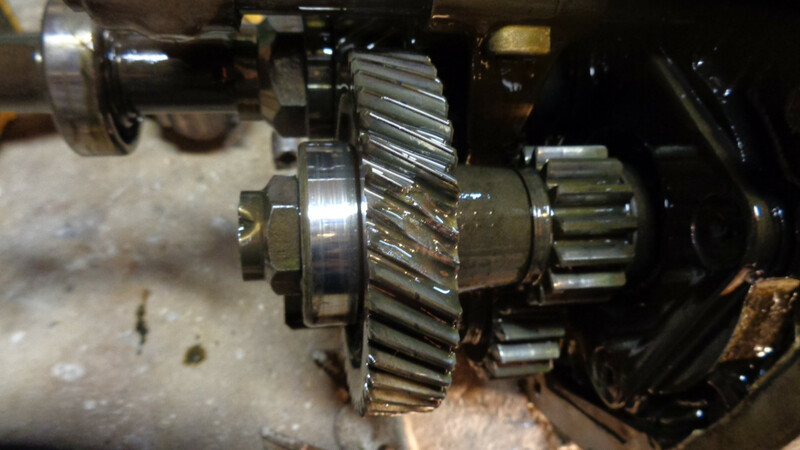 I only found the one part of a tooth in the rear tailshaft housing where this gear is, otherwise the transmission was really clean inside. 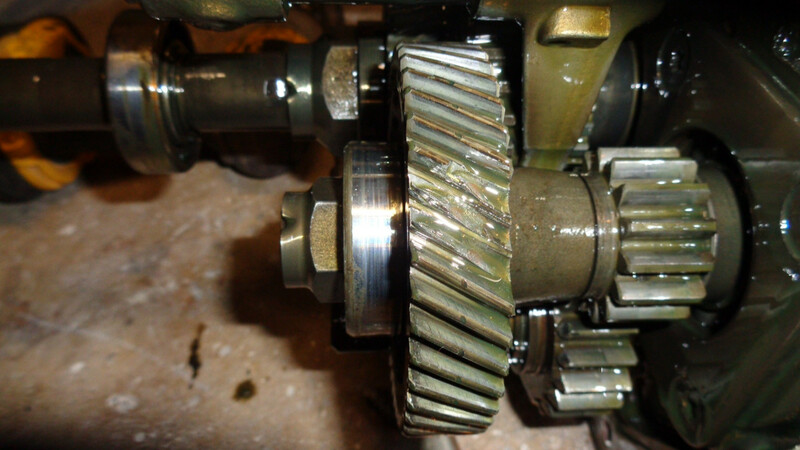 Maybe the start of this issue happened before I owned the truck as I only changed out the front case on this transmission, it was behind a Z24 when I brought it home, at least that is what I recall, I likely put a new lower front gear bearing in this transmission at that time. 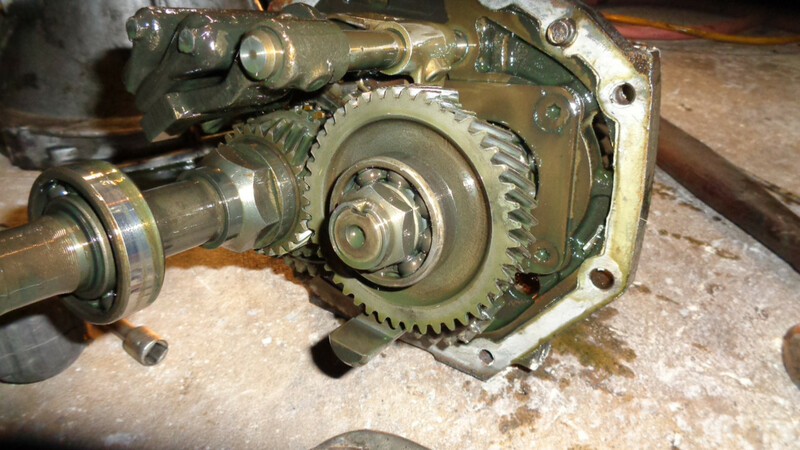 I also might have put that short shaft back together, I will check tomorrow. I went out to look for that short shaft 5spd that had a bearing go thru the front gears next to the input shaft that broke the shaft that had 5th/rev off right past the center section of the middle bearing, I found the transmission gearset but could not find the short piece that had broken off anywhere near that transmission, after looking where it had been before I finally found it in dry dirt just inside my patio wall next to where I had it. I put it in my vice and since the bearing was wasted from the pressure it took to bust the shaft the nut was not staked anymore, it spun right off with the impact, the bearing was easy to remove, I went over to the transmission and un-staked the nut and took it off, the bearing was a little stubborn but finally came off, I slid off the bad gear and put on the gear from the short shaft and it fit perfect so I put the bearing back on and tightened the nut with the impact and turned the shaft a few times and it felt good, I have not staked that nut yet. I went out again and spun the shaft trying to find any play and I looked the the gear that meshed with the old gear and it looked fine, it did not appear to have any blemishes so I am going to call it good to go, I will stake the nut tomorrow and put the cases back on it, and finish putting it completely back together. I have the 1980 Datsun 720 turbodiesel to use for work Monday, so I am not going to rush putting this back together. Since I have it apart I was thinking about looking at the clutch disc, it is not slipping or doing anything weird, but if it is getting close to the rivets maybe I should replace it, I likely have several used discs around here that are good to go.